Team Levitt, at right (Steve in center, with father Michael to his right and sister Linda to his left) faces the St. Paul Academy Spartans. It wasn’ t close. Earlier this month, Freakonomics Radio traveled to St. Paul, Minn., for our first ever live event, at the legendary Fitzgerald Theater. Since Steve Levitt grew up in the Twin Cities, we went a little “this is your life” on him — including his time as a Quiz Bowl captain during high school at St. Paul Academy. Our latest podcast is a live recording from that event. (You can download/subscribe at iTunes, get the RSS feed, listen live via the embedded media player, or read the transcript here.) 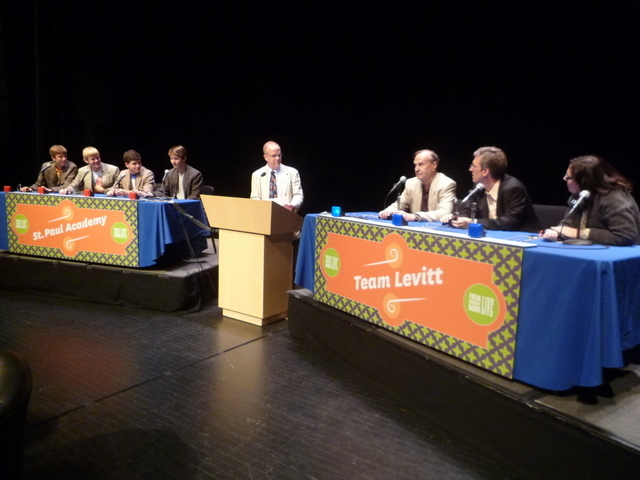 You’ll hear from Levitt, his sister Linda (also a Quiz Bowl captain in her day) and their father, Michael Levitt, a leading medical researcher in intestinal gas who’s known in some quarters as “the King of Farts.” Dr. Levitt was also responsible for drilling his kids in Quiz Bowl questions, day and night. Sisters and brothers don’t always get along so well. While being chased by her father, this granddaughter of Helios hacked up her brother, Absyrtus, thinking her father would be slowed down by having to pick up his boy’s body parts. Name this wife of Jason who was the title character in a Greek tragedy by Euripedes. When the temperature gets above freezing, regular kick wax just doesn’t do the job. Instead, cross-country skiers use a special glue-like paste to improve their traction. The name for this goo actually means ‘paste’ in Norwegian. What’s the word? Let’s check out your knowledge of world capitals. Depending on whether you want to count Vatican City, there are four or five European capitals that begin with the letter ‘V.’ You’ll get 5 points each for naming each of the other four. My favorite answer to that last question? “Vashington, D.C.” Not correct, but clever. I won’t divulge the winner here but I will say this: it wasn’t even close. Hopefully even the vanquished had a good time, however. I know I did, and hope you do listening to it.